Christmas may have not long since finished for another year, but Frankfurt, Germany recently saw it last just that little bit longer. At the largest Christmas fair in the world, Christmasworld, MK Themed Attractions showcased its Christmas-themed solutions created by combining light and fibreglass. Christmasworld takes place every year in Frankfurt am Main at the end of January ab is a place for inspiration and trends to be showcased and for clients to see what possibilities there are for creating a strongly themed Christmas. “Christmasworld is our chance to showcase all our new themed concepts, including our new three extraordinary centrepieces created as a combination of light and fibreglass in close collaboration with our parent company MK Illumination,” said Lars Nielsen, themed attractions specialist at MK Themed Attractions. Those centrepieces include a bird chandelier, a forest stag, and a winter unicorn with RGB light. 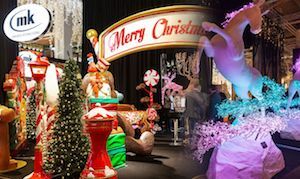 Elsewhere, the company showcased a number of Christmas-focused theming solutions including their new Sweet Treats concept that turns spaces into candy-filled experiences, and their new Vintage Toy Box concept filled with antique, oversized toys. “You can create a truly extraordinary and magical Christmas atmosphere during the winter months, and we see more of our clients wanting to utilise the great potential this season has,” said Nielsen. “Even though some tracks are too cold for the rides to run in amusement parks, it doesn’t mean that you cannot attract visitors – you just attract them through a different experience than what you normally provide. “The fibreglass products create the experience during the day and the light at night, or combine the two to create something truly extraordinary,” concluded Nielsen.